Bonn, 28 April 2016 – Roseline Beudels-Jamar de Bolsée , the CMS Scientific Councillor from Belgium, who has been involved from the very beginning in the Convention’s efforts to conserve Sahelo-Saharan antelopes, has informed the Secretariat of some long overdue positive developments concerning the Scimitar-horned Oryx. 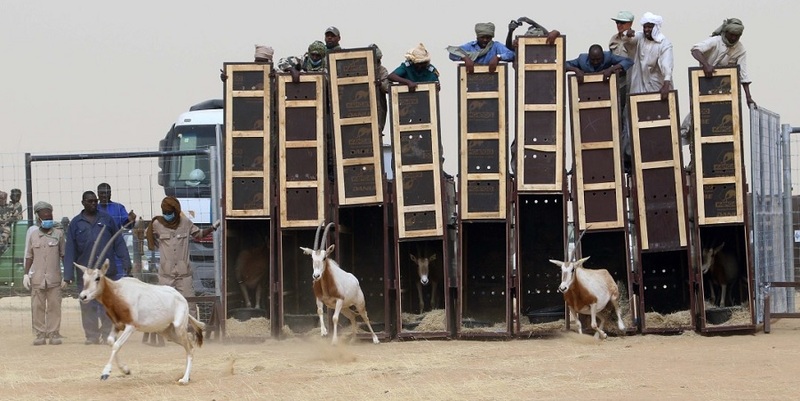 Twenty-five animals have just been shipped from Abu Dhabi to Chad meaning that after an absence of a quarter of a century, Oryx are back on Chadian soil. The civil war which ravaged the country between 1979 and 1982 and a partial invasion by armed forces from the Libyan Arab Jamahiriya had devastating consequences for the country’s Oryx which accounted for the majority of the world’s population of 5,000 animals. Neighbouring Niger’s Oryx are presumed to have died out in the 1980s as a result of drought and hunting. The last wild specimen, an adult male, was killed in 1989. Over three years in the making, the Government of Chad, with the high level support from Chad’s president Idriss Deby, and Environment Agency – Abu Dhabi developed a partnership catalyzed by the Sahara Conservation Fund to develop a unique reintroduction project to release Scimitar-horned Oryx back into their native habitat in Chad. The initial 25 individuals were flown to Chad in March 2016 from United Arab Emirates (UAE). According to the Sahara Conservation Fund, they were part of a “world herd” based in Abu Dhabi and sourced from zoological institutions and private collections throughout the United States and Europe, as well as different collections from around the UAE. A full report of the initiative to reintroduce the Oryx to Chad through the release of captive-bred animals appears in the Spring 2016 edition of Sandscript, the newsletter of the Sahara Conservation Fund, a PDF version of which can be found here.